She was a native of Mt. Sterling, KY, and a resident of Edmonton, KY, at the time of her death. She was a homemaker and of the Baptist faith. She was the matriarch of a large, widely known family. She leaves 39 direct living descendants. 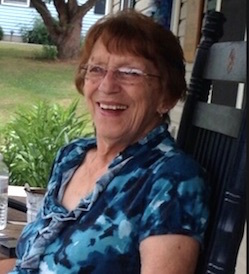 Her final resting place will be in Hubbard Cemetery in Metcalfe County, KY.
Anise Loraine Burris age 74 of Edmonton, KY, passed away Sunday, April 1, 2018 at T.J. Samson Community Hospital in Glasgow, KY.
Funeral services will be held 2pmCT, Thursday, April 5, 2018, at Butler Funeral Home, 201 East Street, Edmonton, KYm with burial in the Hubbard Cemetery at Beechville, Metcalfe County, KY. Visitation will be from 4pmCT until 8pmCT, Wednesday, April 4, 2018, and after 9amCT, Thursday at the funeral home. Born in Mt Sterling, Montgomery County, KY, May 30, 2018, she was the daughter of the late Stanley & Martha Reddix Watkins. She died Sunday, April 4, 2018, in Glasgow, Barren County, KY, at the age of 74 years, 10 months, and five days. She was a homemaker and of the Baptist faith. Fourteen grandchildren: Amanda (Jason) Pedigo, Josh and Chasity Howard, Adam and Letitia Howard, Christy Thomason, Corey Wilson, Maranda and Tyler Dubree, Tyler and Whitney Geralds, Brandy and Zack Scott, Billy and Misty Davis, Kaleb and Ruchelle Burris, Bradley Thomas Ross, Tanner Gage Ross and Tinley Sue Ross. Besides her parents she was preceded in death by a grandson Robert William Burris. Butler Funeral Home, 201 East Street, Edmonton, KY, is in charge of arrangements. 2018-04-04 - 201 East Street, Edmonton, KY - Photo from Butler Funeral Home.